In a week when Mississippi State and Alabama were bound to mix up the College Playoff picture, it was another contender who watched its Playoff hopes vanish among the Giant Killers. Heisman finalist, Dak Prescott, struggled against Alabama and finished with three costly interceptions. Alabama – Coming off of an overtime win in Death Valley against LSU, Alabama headed home with a lot of confidence in its chances against No. 1 Mississippi State. Alabama controlled its own destiny with only one loss to Ole Miss, and now has taken sole possession of the SEC West division lead. If the Crimson Tide wins its next two games and the SEC Championship, it will be headed to the College Football Playoffs. Mississippi State – After surviving through 12 weeks of the SEC West, the Bulldogs finally were exposed in the nation’s second toughest division, next to the Pac-12 South. 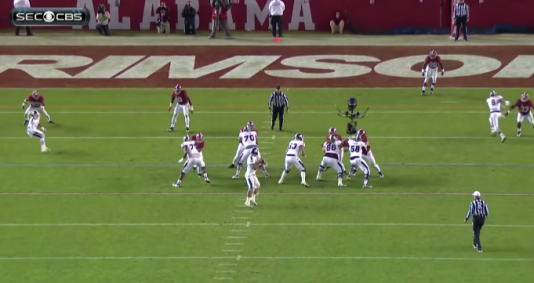 In a game where Dak Prescott struggled and threw three interceptions, Alabama’s defense looked the part of the nations best. The Bulldogs now become huge Auburn fans, as they need an Alabama loss to get to the SEC Championship, and potentially the College Football Playoffs. Up next: A home game versus Vanderbilt followed by a game at rival Ole Miss. Florida State – After trailing by 16 points on the road to Miami, Jameis Winston pulled off some late magic once again leading the Seminoles to a 30-26 win. The Seminoles defense held Miami to just three points in the second half, and now the Seminoles have won 26 straight games. Up next: Two home games against Boston College and Florida. TCU – After an impressive win over Kansas State last week, TCU struggled the entire first half against a Kansas team that has only had two conference wins since 2012. Although the Horned Frogs pulled away with the win, it was far from impressive and could possibly move them a step back from the College Football Playoffs. Up next: An away game against an improved Texas team on Thanksgiving night. Ohio State still has a home game versus Michigan after Indiana. They will need to win both to stay in playoff contention. Ohio State – In a frigid game with occasional snowfall, the Buckeyes were tested for 60 minutes against a strong Minnesota team. J.T. Barrett led the Buckeyes with nearly 400 total yards of offense, three passing touchdowns and another rushing one. The Buckeyes still need help from a few one-loss teams but certainly didn’t hurt their chances with a good road win. Up next: Two home games against Indiana and Big 10 rival Michigan. Oregon – The Ducks spent their bye weekend hanging out with famous comedian Kevin Hart at his special screening of his unreleased movie “The Wedding Ringer.” Up next: The Ducks will be at home for Senior Day against Colorado and then play at Oregon State for the Civil War. Baylor – The Bears had their final bye week, and now will have three straight home games: Oklahoma State, Texas Tech, and Kansas State. If the Bears win out, they will certainly be in the conversation for a spot in the College Football Playoffs. 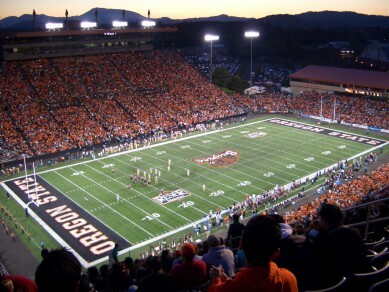 Reser Stadium has been the home of Oregon State’s major upsets in the last ten years. After jumping up to being ranked as the sixth-ranked team in the nation, the Arizona State Sun Devils became the latest victim of the Giant Killers. After scoring 21 unanswered points, the Sun Devils stepped off the pedal just a hair too early as Oregon State outscored the Sun Devils 21-3 in the second half, leading to a 35-24 upset win. The loss for Arizona State opens up the Pac-12 South division once again, after USC and Arizona both won this week. There are now four teams with two losses in the South division, and the winner of the division will likely be determined from the two rivalry matchups between USC-UCLA and Arizona-Arizona State. Oregon Ducks volleyball will host UCLA and USC for its final two conference games of the season on Friday and Sunday. Volleyball – After falling to No. 14 Arizona in four sets, the No. 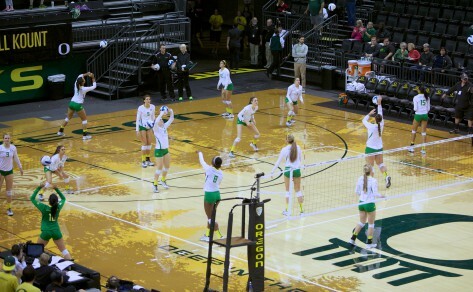 10 Oregon Ducks volleyball team responded with a gritty 3-2 set win over No. 19 Arizona State. Oregon finished with 111 digs, which was the second most in the Pac-12 this season, in a game that was a defensive battle. Oregon will return home for its final set of conference games against UCLA and USC. The match against USC on Sunday will be Senior Day for five Oregon student-athletes. Cross Country – Both the men’s and women’s cross country teams competed in the NCAA West regional this past week. The teams swept the meet for the first time in 26 years after the men’s team placed five runners in the top 20 and the entire women’s team finished in the top 24. With the sweep, both teams automatically advance to the NCAA Championships Nov. 22 in Terre Haute, Ind.